Both the Android-running slates are designed and built to withstand hard abuse and the elements alike. Interested? Here are some specs for you. The Toughpad A1 packs a 10-inch 1024 x 768, 4:3 display with anti-gale protection and stylus-friendly surface. The whole package is powered by a 1.2GHz dual-core Marvell processor, 1GB of RAM and a user-changeable 33.9Wh Li-Ion battery pack capable of running this ultra-durable slate for 10 hours. You also get 16GB for content storage, expandable thanks to a microSD slot. There’s also a mircoUSB and micro HDMI ports as well. At the front the A1 has a 2MP fixed focus camera, while the back has the juicer 5MP auto-focus snapper with LED light. LTE or WiMAX connectivity options are present, too. 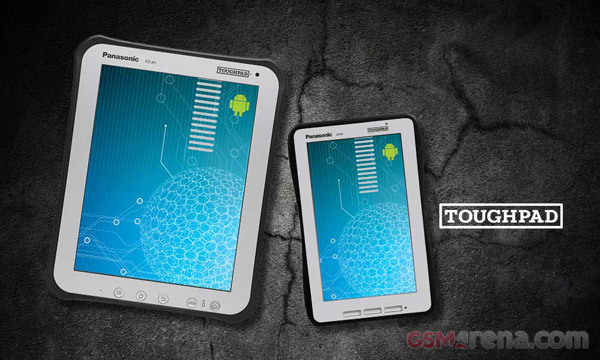 As for the other Toughpad, the 7-inch B1, there’s not much information available for it at this time. However, it’s still going to feature all the tough bells and whistles of it’s bigger brother. Nevertheless, check it out posing for some official imagery. If are interested in getting one of those marine slates prepare your wallet to get destroyed. The pricing of the Toughpad A1 starts at $1,300 and the last time we checked this wasn’t exactly cheap. Naturally, the B1 should be cheaper, but how much is still anyone’s guess. Expect both slates to hit the market early next year. And while you’re wondering why would anyone pay such a colossal amount of money for a tablet, check this video of what the Toughpads can withstand and it’ll hopefully answer your question.